If you'll be in Huntsville this Thanksgiving and want to eat out for dinner instead of going through the hassle of cooking at home, there are several restaurants that will be open during the holiday this year. Located in the northern part of the state, Huntsville, Alabama, is home to the U. S. Space & Rocket Center, the Huntsville Botanical Garden, and plenty of outdoor adventures in Monte Sano State Park including the Burritt on the Mountain attraction. Whether you're in town visiting family or busy taking your loved ones around to some of the local attractions, you can save time this holiday season by skipping the chore of cooking and going to out to eat your Thanksgiving feast instead. Whatever your reason for wanting to forgo the home-cooked route this holiday season, these Hunstville restaurants will be open on Thanksgiving Day 2018 and serving a feast for brunch or dinner. Located near the U.S. Space and Rocket Center, the Huntsville Marriott is the closest hotel to these great attractions, making it the ideal accommodation for your vacation to the city. The Marriott also features two restaurants—The Great Room and Season's—and Season's will be open on Thanksgiving this year for its annual holiday brunch. The Thanksgiving brunch menu will feature holiday favorites like smoked ham and oven-roasted turkey, sausage dressing, and turkey gravy alongside popular breakfast favorites like omelets and egg scrambles. You can choose between ordering a la carte or prix fixe, and Season's also offers a special menu for younger children, making this a great place to bring your whole family for your holiday meal. The Sage Grill at The Westin Huntsville will offer its annual Thanksgiving brunch buffet this year, which features more than 100 different items. So, if you want something other than turkey, you'll easily find fare to satisfy your palate, and although seating is every 30 minutes for this decadent meal, you'll need to book your reservations in advance if you want to attend this unique holiday buffet. The buffet features a salad and pasta bar, seafood and meat carving stations, children's favorites like chicken strips and french fries, a dessert station, a hot buffet of holiday favorites, and a breadboard featuring everything from dinner rolls to sliced bread. The buffet will even include a flipping station where you can have your eggs and omelets cooked to order. The Thanksgiving menu features traditional favorites like oven-roasted turkey, classic sausage dressing, turkey gravy, mashed potatoes, dinner rolls, and a dessert of pumpkin or apple pie. Ruth's Chris Steak House in Huntsville—along with Ruth's Chris restaurants all over the South—will serve a traditional dinner on Thanksgiving Day. The Huntsville restaurant, an anchor at Twickenham Square, is offering a three-course prix-fixe menu for $40 for adults and $13 for kids. This three-course meal starts with traditional seasonal appetizers like butternut squash bisque and continues with a selection of entrees and sides like herb-seasoned stuffing, whipped potatoes, and oven-roasted turkey breast. 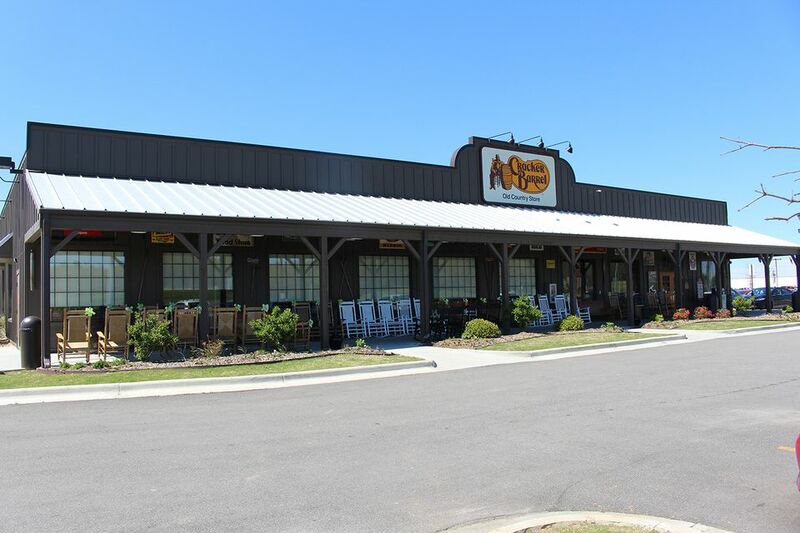 Order breakfast all day at the Cracker Barrel in Huntsville or a traditional Thanksgiving dinner starting at noon. For $13 for adults and $8 for kids, you can get a huge spread of turkey, dressing, and gravy; sugar-cured ham; sweet potato casserole; cranberry relish; biscuits or corn muffins; and pumpkin pie. Alternatively, you can order any regular menu item, such as chicken and dumplings, meatloaf, roast beef, country-fried steak, rib eye steak, catfish, haddock or shrimp dinners.